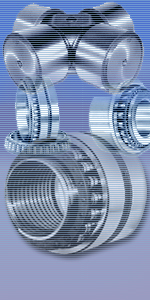 JMC Split Bearing is basically a Cylindrical Roller Bearing cut into two halves. These bearings are used mainly in the middle of shafts where mounting and dismounting can be done without disturbing adjacent components. These bearings are called as crank pin bearings of heavy duty connecting rods. It is an ideal support in the middle of long shaft, without any step, recess or threading and hence can be fitted firmly any where along the length of the cold drawn shaft of h11 tolerance. 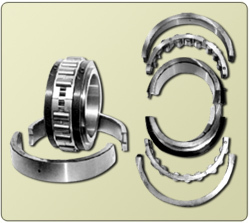 The Bearing can be serviced or replaced easily without disturbing the adjacent components. Reduces Downtime and Installation Cost.